We’ve got a lot of stuff. That’s the simplest reason why this industry is so successful — but it’s not the only reason. My current research project is on self-storage in America. 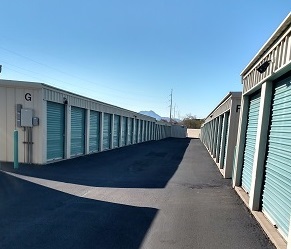 Though people all over the world have stuff they can’t or won’t keep with them, storage units remain a uniquely American thing. Born in the early days of Sunbelt migration right after World War II, the industry has expanded dramatically. 90% of the world’s units are in the United States, and occupancy rates are very high. I’m finding out how people use them, what kinds of problems they can solve or facilitate, and what kinds of things we put in them — and, of course, why. One thing that interests me is how we talk about the stuff we keep around us. Self-help literature about decluttering and getting rid of your stuff is everywhere – from the practical KonMari method popularized by Marie Kondo in her #1 New York Times Bestseller The Life-Changing Magic of Tidying Up all the way to Andrew Hyde and others’ “extreme minimalism” movement which seeks to limit personal possessions to under a set small number. And within the last two years or so, there’s been a bit of a backlash — people who wonder whether the enthusiasm for paring down our stuff is really all that life-changing, at least in the way that everyone would like their lives to change. Doing more with less stems too much from necessity for many people living hand-to-mouth for that process of unburdening to create much joy. The self-storage industry in the U.S. is robust. The most common use for storage units is for personal possessions – because people feel they have too many, because they have nowhere else to keep them if life throws a curveball, or because some things are just hard to let go of. But as the industry grew, so did the varying ways people found to use these small, spare, rented spaces. Entrepreneurs and the self-employed keep inventory and equipment in units. People who travel or relocate a lot rent storage space instead of barely-used apartments. Some storage facilities offer specialized storage for art, for vehicles and boats, for fine wines or expensive cigars. At the other end of the economic spectrum, storage units provide a temporary but tricky solution to eviction, foreclosure, and homelessness. In my interviews so far, I”m finding remarkable numbers of uses that I wouldn’t have thought of in advance. The availability of storage units can ease people’s minds or it make them more irritated. Everyone, it seems, has a storage unit story (at least one), even if they don’t have a storage unit.